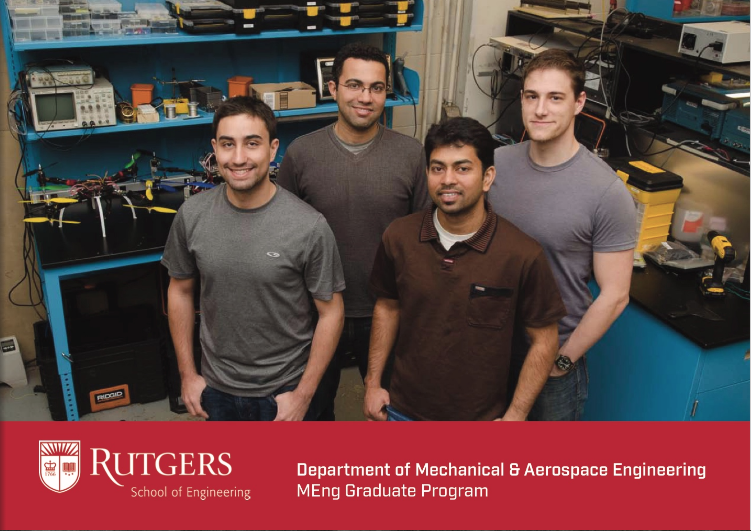 Welcome to the Mechanical and Aerospace Engineering Department at Rutgers University! 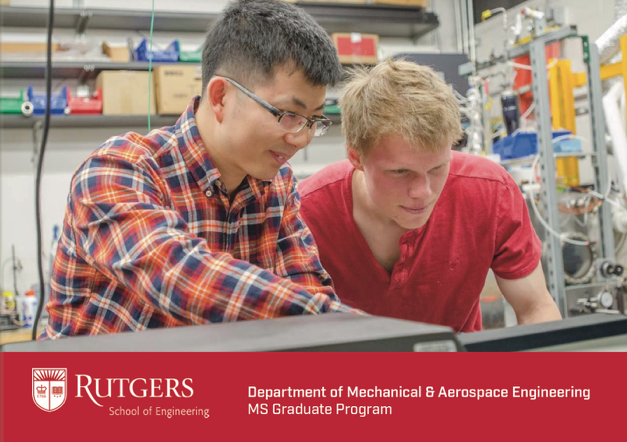 MAE is the largest of the engineering disciplines at Rutgers with nearly 800 students and more than 30 full time faculty members, as well as one of the oldest, having been founded in 1908. 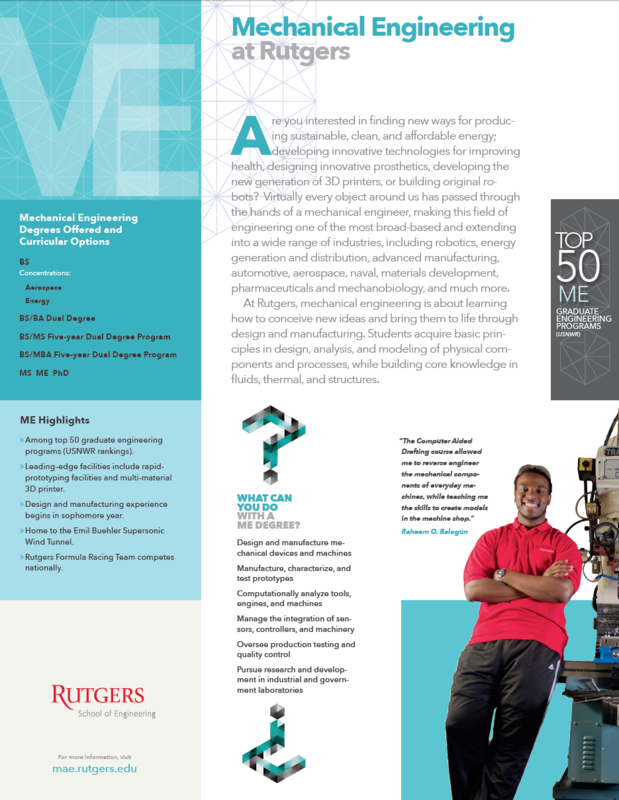 Today, we have one of the top 50 Graduate Engineering Programs in the nation, according to U.S. News and World Report. We are an energetic and multidisciplined group advancing research in a variety of exciting areas, including nanostructures, autonomous robotics, electrohydrodynamics, fluid interactions, energy science, and advanced materials. Our community of students, faculty, alumni, and industry partners are devoted to collaborative work at the highest standards of research and innovation. Every faculty member here is dedicated to helping our students achieve through teaching excellence and an exciting array of research projects. Students have access to a wide range of classes that train them in the core principles of mechanical engineering. They have the opportunity to participate in research projects as undergraduates, allowing them to gain experience in real-world applications comparable to research conducted by industry. The MAE department has seen exciting growth in recent years in a variety of research areas, incorporating joint research projects with other departments within the School of Engineering as well as with industrial and government partners. 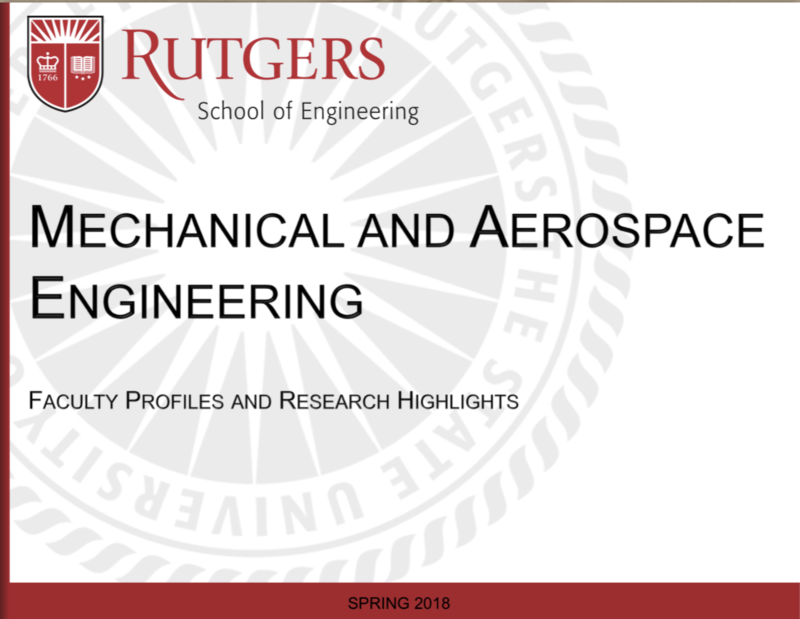 Outside of their classroom experiences, students can practice engineering skills through student-run organizations such as the Rutgers Formula Racing team and the local chapter of the American Institute of Aeronautics and Astronautics. 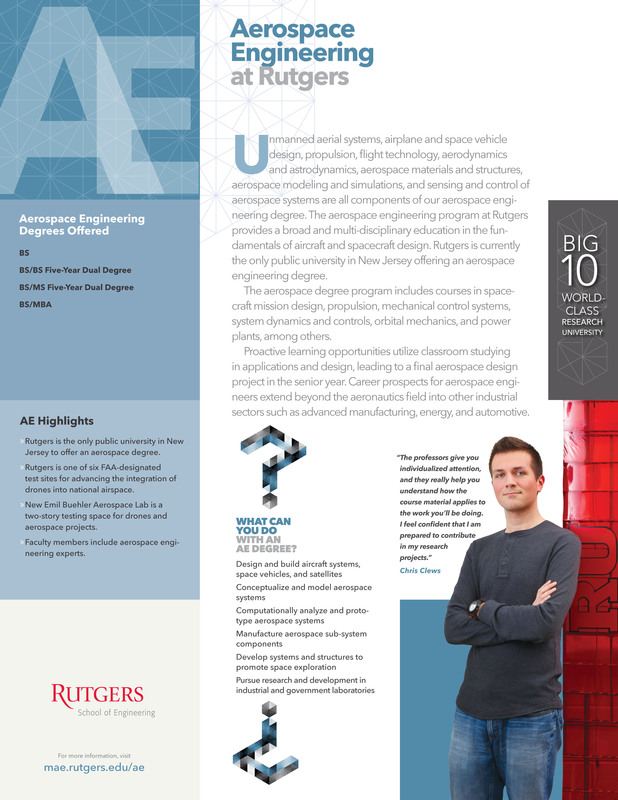 Both of these organizations not only design and build unique machines utilizing advanced engineering lessons, they compete with teams from around the world at events hosted by industry partners. Excellence in teaching is a priority for our faculty members who take seriously their role as educators, training students to be problem solvers and innovators. 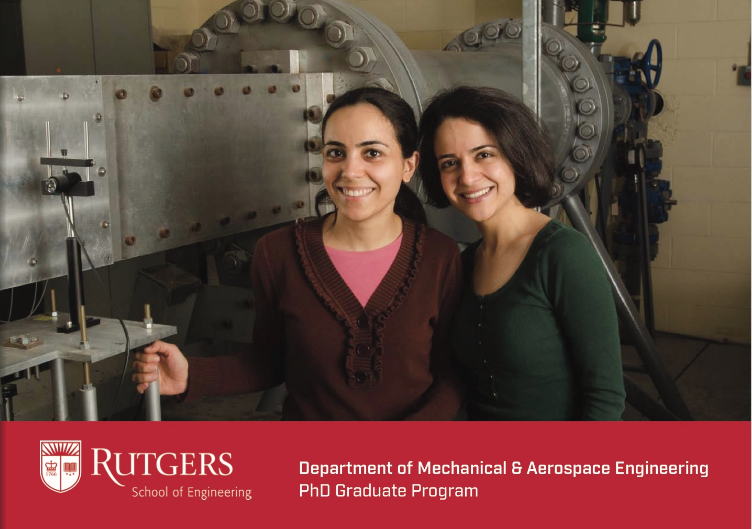 Our faculty has achieved distinction among their peers and as fellows of professional engineering societies, including the American Society of Mechanical Engineers (ASME), American Physical Society (APS), Acoustical Society of America (ASA), and American Academy of Mechanics (AAM). In addition to the departments' core faculty members, several visiting scientists and experts from local industry contribute to the learning experience. We hope all interested students, faculty, and others will join us in continuing to advance society through the collaboration of technology, discovery, and design.